Coronary angioplasty has vastly improved both in technique and devices since the first angioplasty in 1977. Currently, stent implantation is used almost ubiquitously, despite being developed originally to treat vessel threatening dissections. Newer concepts including absorbable polymers or fully bioabsorbable scaffolds are constantly being developed. However, we find the concept of no permanent implant whilst still delivering a chemotherapeutic drug to reduce restenosis very attractive given the long term implications of a metallic stent, which include restenosis, late thrombosis and neo-atheroma formation. The use of a drug-coated balloon-only approach to de novo angioplasty will avoid the late thrombotic problems whilst also reducing early restenosis, simplifying the procedure and reducing the dual antiplatelet duration to 1 month. We review the current literature and highlight our practice with regard to use of drug-coated balloons in treatment of de novo coronary artery disease. The salary of UW (Clinical Research Fellow) is funded by the National Institute of Health Research via Research Capability Funding and an unrestricted research grant from B. Braun, Melsungen AG, Germany. SE receives speaker’s fees and acts as a consultant for B. Braun. Percutaneous coronary interventional techniques and devices have evolved enormously since Gruntzig performed his first coronary angioplasty in 1977. 1 It is now the norm to treat patients with both acute coronary syndrome and stable coronary artery disease with drug-eluting stents. We intend to review the evidence and discuss potential benefits of drug-coated balloon-only angioplasty. These include return of original vasomotion, positive remodelling and avoiding stent-related complications such as stent under-expansion, malapposition, neo-atheroma, stent fracture, polymer/metal reactions and late/very late stent thrombosis. However, before we turn our attention to treatment of native coronary artery disease with drug-coated balloons, it is prudent to revisit history and understand what led to current practice. Interventional cardiologists who have been practicing long enough will remember the days of plain old balloon angioplasty (POBA) as challenging times. Acute complications such as acute vessel closure, flow-limiting dissections, acute recoil and vessel thrombosis as well as the medium term need for a second procedure due to restenosis were all troublesome. The introduction of bare metal stents (BMS) initially addressed the acute complications rather than the incidence of thrombosis and restenosis. Subsequently, the Belgian Netherlands Stent study (BENESTENT) and Stent Restenosis Study (STRESS) showed reduced restenosis rates with BMS compared with POBA (22 versus 32 % [p=0.02] and 31.6 versus 42.1 % [p=0.046], respectively). 2,3 These studies drove a significant increase in use of BMS in the 1990s. In other words, the price to be paid to overcome the acute complications and reduce restenosis was a permanent metal implant. Interestingly, only 5.1 % (BENESTENT) and 6.9 % (STRESS) of patients from the angioplasty-only arm had to crossover to the stent group due to acute complications (i.e. acute vessel closure, flow-limiting dissection or a suboptimal angiographic result). So the question is, do all patients need a permanent metallic stent implant? The TAXUS I-IV, Randomized Study with the Sirolimus-eluting Bx Velocity Balloon-expandable Stent (RAVEL) and Sirolimus-coated Bx Velocity Balloon-expandable Stent in the Treatment of Patients with De Novo Native Coronary Artery Lesions (SIRIUS) trials all showed benefits of DES over BMS in the reduction of target vessel revascularisations and restenosis rates. 4–9 The Randomized Controlled Trial to Evaluate the Safety and Efficacy of the Medtronic AVE ABT-578 Eluting DriverTM Coronary Stent in De Novo Native Coronary Artery Lesions (ENDEAVOUR) trial programme as well as the Clinical Evaluation of the XIENCE V® Everolimus Eluting Coronary Stent System (SPIRIT II and III) studies showed the benefits of second generation DES over first generation DES. 10–12 However, in-stent restenosis (ISR) and stent thrombosis continue to trouble both patients and interventionists, albeit at a lower rate, but with ever-increasing absolute numbers due to the increasingly widespread use of stents. In a 4-year follow-up of the Randomized, Twoarm, Non-inferiority Study Comparing Endeavor-Resolute Stent with Abbot Xience-V Stent (RESOLUTE-AC All-Comers) study, the patientoriented composite endpoint (all-cause death, myocardial infarction [MI] or any revascularisation) was 30.4 % and 28.6 %, respectively. 13 We feel these results should make the percutaneous coronary intervention (PCI) community consider alternative methods of revascularisation. The argument that long-term outcomes should perhaps be more favourable when there is no permanent coronary implant has driven the development and implantation of bioresorbable vascular scaffolds (BVSs), with the scaffold being completely reabsorbed in approximately 4 years. 14 In the ABSORB III Randomized Controlled Trial (ABSORB-III), scaffold thrombosis (1.5 %), target vessel MI and target vessel revascularisations (TVRs) were all higher than the second generation DES (but not statistically significant). 15 The ISAR-ABSORB registry showed definite scaffold thrombosis of 2.6 % at 12 months follow-up. 16 The early problems of scaffold implantation are still widely discussed and debated, but again we find these event rates high compared with existing treatment modalities. Drug-coated balloons (DCBs) are standard (semi-compliant) angioplasty balloons coated with a cytotoxic chemotherapeutic agent. Currently, the majority of commercially available DCBs use paclitaxel. In our centre we predominantly use the balloon we feel has the best evidence (SeQuent® Please NEO, B. Braun Melsungen AG, Germany). This balloon utilises iopromide (a contrast medium) to act as the excipient to retain the drug on the balloon and, on balloon inflation, to facilitate rapid delivery to the vessel wall due to its lipophilicity. The dose of Paclitaxel is approximately 3 micrograms/mm 2. The drug is delivered homogeneously to the vessel wall during balloon expansion (unlike the uneven distribution seen with drug-eluting stents). The terminal half-life is almost 2 months. 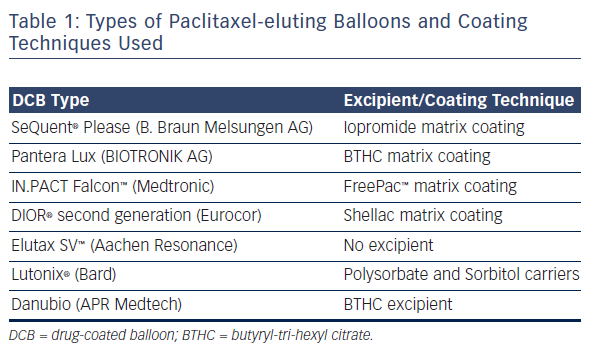 17 There are different types of paclitaxel-coated balloons available in the market using different coating techniques and excipients (summarised in Table 1). A sirolimus coated balloon (SCB) has been introduced more recently with satisfactory bench testing and clinical outcomes. 18 A registry of 277 patients with both de novo (55.42 %) and ISR (44.58 %) treated with SCB (Magic Touch TM balloon) has shown a major adverse cardiac event (MACE) rate of 5.38 % in the 186 patients who have undergone 12 months clinical follow-up so far (Transcatheter Cardiovascular Therapeutics [TCT] presentation, 2015). 19 However, there are no formal angiographic follow-up data available as yet. Brodie et al. have published a long term longitudinal follow-up registry of 2,195 consecutive patients treated for ST elevation myocardial infarction (STEMI), comparing POBA to BMS and DES, and showed better long-term outcomes in the balloon angioplasty arm (POBA [n=601], stenting [n=1,594] from 1994 to 2010). 20 Target vessel re-infarction and stent/lesion thrombosis were better with POBA compared with stents between 1 and 9 years (3.1 versus 7.9 % [p<0.001] and 2.9 versus 6.1 % [p=0.002], respectively; see Figure 1). Landmark analysis at 12 months showed a trend in favour of stenting with a non-significantly lower re-infarction rate only. It should be noted that there was no bail-out stent option in case of a vessel threatening complication (stents were only used from 1999 onwards outside of research procedures) and only single antiplatelet therapy was often used. In this cohort of balloon angioplasty cases only 23 % were discharged on thienopyridines. However, all patients received the standard treatment of the time. The authors concluded that there is a long term risk associated with a permanent coronary metallic implant. A DCB-only strategy has the potential to overcome the long term complications of stent systems by avoiding a permanent implant, thus allowing the blood vessel to regain its original vasomotion and undergo positive remodelling. Togni et al. illustrated how stented segments do not undergo any vasodilatation during exercise, whilst those segments adjacent to sirolimus stents showed paradoxical vasoconstriction on exercise. 21 Adverse effects of sirolimus stents on local endothelium dependent vasomotion have also been shown by Hofma et al. 22 In contrast, whilst there is no published data on restoration of normal endothelial vasomotor function after DCB-only PCI, there is evidence of positive remodelling resulting in late luminal gain as shown by Kleber et al. 23 This remodelling process is beneficial post DCB-PCI, but in the presence of a permanent metallic cage could result in late malapposition with subsequent late complications. The disadvantages of delayed endothelialisation, chronic inflammation, malapposition and under-expansion are all irrelevant when there is no permanent implant. The major difference between DCB and other treatment options is that the DCB option does not require even a temporary implant. Hence we suggest that a strategy which tackles the problem of restenosis whilst not involving a permanent metal stent or semi-permanent polymeric scaffold could be attractive in the vast majority of patients who undergo angioplasty when acute complications such as a flow-limiting dissection, vessel closure or recoil do not occur. It would be suitable in more than 90 % of patients undergoing angioplasty as shown in the BENESTENT and STRESS trials, but we do accept current PCI practice incorporates much more complex anatomy and techniques. We propose this is where DCB angioplasty has a role to play. It does not leave a permanent implant but targets restenosis with the delivery of a cytotoxic/cytostatic drug to the vessel wall. Obviously, DES and BVS will be necessary tools to have in the armoury in case of acute complications mentioned above. Many early DCB studies (Paclitaxel Eluting Balloon Versus Drug Eluting Stent in Native Coronary Artery Stenoses of Diabetic Patients [PEPCAD IV], Paclitaxel-eluting Balloon Angioplasty and Coroflex™-Stents in the Treatment of Bifurcated Coronary Lesions [PEPCAD V], Drug-eluting Balloon in Acute Myocardial Infarction [DEB-AMI] and The Paclitaxeleluting Percutaneous Transluminal Coronary Angioplasty (PTCA) - Balloon Catheter in Coronary Artery Disease to Treat Chronic Total Occlusions [PEPCAD CTO]) were carried out in conjunction with the implantation of a BMS, which in our view, takes away the long term advantages of a DCB-only/no permanent implant approach. 24–27 We will therefore not discuss these further. There are a number of registries showing low event rates with DCB-only angioplasty in small vessel disease. The Paclitaxel-eluting PTCA-Balloon Catheter to Treat Small Vessel (PEPCAD I) study (82 patients with 2.25–2.80 mm vessel diameter treated with SeQuent Please) showed a MACE rate (composite of death, MI, target lesion revascularisation [TLR], treated lesion/stent thrombosis) of 6.1 % and a TLR rate of only 4.9 % at 3-year follow-up. 28 Zeymer U et al. in a real world prospective registry of 479 patients with small vessel disease (≥2.0 mm, ≤2.75 mm) treated with DCB angioplasty (SeQuent Please) showed a TLR rate of only 3.6 % at 9-month follow-up. 29 There were no cardiac deaths. In the SeQuent Please worldwide all-comer registry, the DCB-only group (390 patients) showed event rates for MI 0.7 %, cardiac death 1.0 %, TVR 1.0 % and TLR 1.0 % at 9-month followup. 30 The Elutax small vessel registry with 251 real world patients, 59 % of whom had native vessels treated with DCB angioplasty, showed a TLR rate of 2.0 %, cardiac death of 0.8 % and no target vessel MI or thrombosis at an average 225-days’ follow-up. 31 Ho et al. reported TLR of 4 % at 9 months in a real world registry of 320 South-East Asian patients treated with SeQuent Please DCB (76 % de novo disease, 54 % small vessels and 76 % presented with acute coronary syndrome [ACS]). 32 The single-arm, prospective, multicentre Valentines-II trial (103 patients, treated with second generation DIOR® DCB) showed a TLR rate of 2.9 %, a TVR of 6.9 % (including TLR), 1.0 % MI and 0.0 % cardiac death at 7.5 months. 33 The Leipzig Prospective Drug-Eluting Balloon-Registry reported 76 patients treated with a DCB-only (SeQuent Please) for native coronary artery disease with no TLR at 2 years. 34 The incidence of MI was 3.9 % with nine deaths (all-causes) during follow-up. It is important to note that most of these registries were real life studies, which included patients from high risk categories such as post-STEMI, non-ST segment elevation myocardial infarction (NSTEMI) and bifurcation lesions. The Paclitaxel-coated Balloon Versus Drug-eluting Stent During PCI of Small Coronary Vessels, a Prospective Randomised Clinical Trial (PICCOLETO) study showed a higher percentage diameter stenosis (43.6 versus 24.3 %; p=0.029) and higher restenosis rates (32.1 versus 10.3 %; p=0.043) in the DCB (first generation DIOR) treated arm compared with the paclitaxel-eluting stent (PES) arm in 60 patients with small vessel disease at 6 month angiography and 9-month clinical follow-up. 35 It should be noted that first generation DIOR balloons have shown lower delivery of drug to the vessel wall. The roughened surface coating technique of this balloon was shown to be inferior to matrix coating in achieving neointimal suppression. 36 Furthermore, 75 % of patients of the DCB arm did not have any predilatation done and 35 % of DCB patients had a BMS implanted, further impacting on the outcome of the technique. The randomised controlled multicentre Balloon Elution and Late Loss Optimization (BELLO) study (total of 180 patients) showed better outcomes of DCB-only (IN.PACT Falcon TM [Medtronic]) treatment as compared with PES for vessels with a diameter of less than 2.8 mm. 37 The primary endpoint of in-stent (or ’in-balloon’) late loss was significantly less with DCB compared with PES (0.08 ± 0.38 versus 0.29 ± 0.44 mm [difference -0.21]; 95 % CI [-0.34–0.09]; p [noninferiority]<0.001; p [superiority]=0.001). Of note, bail-out stenting was required in 20 % of lesions in the DCB group. The Paclitaxel-eluting Percutaneous Coronary Angioplasty (PTCA)- Balloon Catheter for the Treatment of Coronary Bifurcations (PEPCADBIF) trial randomised 64 patients with bifurcation lesions to DCB-only (SeQuent Please) or POBA treatment and showed a binary restenosis rate of 6 versus 26 % (p=0.045), respectively at 9-month follow-up. 38 Late luminal loss was significantly less with DCB-only treatment (0.13 mm in the DCB and 0.51 mm in the control POBA group; p=0.013; 95% CI [-0.66–0.08]), whilst the TLR rates were 3.12% for DCB and 9.38 % for POBA (not statistically significant). In an abstract presented at EuroPCR in May 2016, Rosenberg et al. showed a TLR rate of only 2.3 % in 731 de novo lesions (vessel size of 2–4mm and lesion length of <25 mm) after 9 months clinical followup. 39 This was a prospective, international, multicentre registry with a total of 1,025 patients with both de novo and ISR lesions. Cortese et al. have reported angiographic follow-up data at a mean 201 days post-procedure of 48 DCB (Restore [Cardionovum] and Elutax SV [Aachen Resonance]) treated patients, who had a type A-C dissection (18, 25 and five patients, respectively) left uncovered with a stent. 40 Of these, 45 patients (93.8 %) had healed completely, three had persisting dissections and one received a DES follow-up. No cardiac death or other TLRs occurred in this group of patients with unstented dissections. This latter study highlights the issue of safe outcomes after balloon angioplasty-only despite the angiographic appearances of vessel dissection. To perform DCB-only PCI, care must be taken to prepare the lesion adequately before delivering the drug. Standard semi- and or noncompliant balloons, and if necessary, more specialised cutting or scoring balloons are used to achieve an adequate angiographic result. Gentle predilatation is performed at a 1:1 balloon-to-vessel ratio with adequate pressure to achieve full balloon expansion rather than standard high pressure inflation. Then the final treatment is carried out using the DCB, which is kept expanded for 30–60 seconds. The concept of the DCB is to act as a drug delivery device only, not to perform further angioplasty. We generally follow the German consensus guidelines, which recommend a DCB-only strategy unless residual stenosis of more than 30 % or dissections of more than type B are present. 41 If any of the above two are present, particularly in the context of less than thrombolysis in myocardial infarction (TIMI) III flow, we recommend bail-out stenting to be performed. Heavily calcific vessels may require rotablation to avoid balloon-induced major dissection, whilst aorto-ostial lesions can limit the utility of DCB-only PCI due to the higher incidence of recoil. Dual antiplatelet therapy is required for only 1 month after DCB-only elective procedures or 1 year for treatment of ACS. As with all procedures there is a learning curve in performing DCBonly angioplasty. Adoption rate varies from operator to operator based on their personal experience and exposure. We recommend a visit to a centre where DCB angioplasty is performed routinely to observe the procedure and carry out cases in conjunction with an experienced operator. 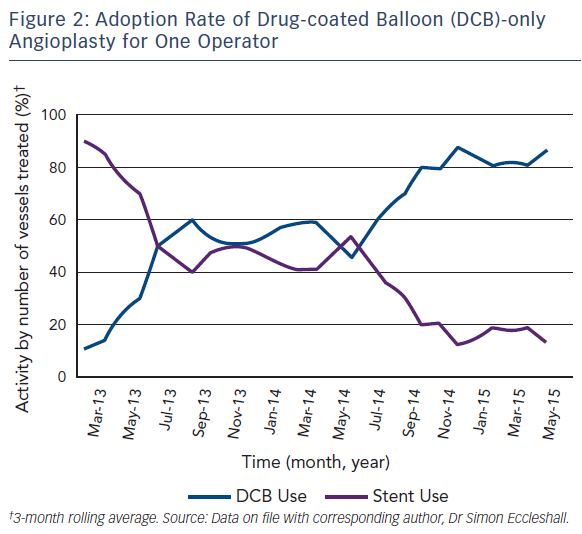 Published here is the adoption rate of DCB-only angioplasty for one of the operators in our department (see Figure 2). Also published here are three illustrative case studies (see Figures 3–5). We believe the DCB-only approach for coronary interventions with use of DES/BVS only in bail-out situations (originally shown to be around 5–6 % of angioplasty patients as per the STRESS and BENESTENT trials) will lead to better short, medium and long-term outcomes based on these observations. A large, randomised trial comparing DCB to second generation DES in de novo coronary artery disease, with long-term follow-up is required to demonstrate these benefits further. Gruntzig A. Transluminal dilatation of coronary-artery stenosis. Lancet 1978;311 :263. Serruys PW, de Jaegere P, Kiemeneij F, et al. A comparison of balloon-expandable-stent implantation with balloon angioplasty in patients with coronary artery disease. Benestent Study Group. N Engl J Med 1994;331 :489–95. Fischman DL, Leon MB, Baim DS, et al. A randomized comparison of coronary-stent placement and balloon angioplasty in the treatment of coronary artery disease. Stent Restenosis Study Investigators. N Engl J Med 1994; 331 :496–501. Grube E, Silber S, Hauptmann KE, et al. TAXUS I: Six- and Twelve-Month Results From a Randomized, Double-Blind Trial on a Slow-Release Paclitaxel-Eluting Stent for De Novo Coronary Lesions. Circulation 2003;107:38–42. Colombo A, Drzewiecki J, Banning A, et al. Randomized study to assess the effectiveness of slow- and moderaterelease polymer-based paclitaxel-eluting stents for coronary artery lesions. Circulation 2003;108:788–94. Tanabe K, Serruys PW, Grube E, et al. TAXUS III Trial: in-stent restenosis treated with stent-based delivery of paclitaxel incorporated in a slow-release polymer formulation. Circulation 2003;107(4):559–64. Stone GW, Ellis SG, Cox DA, et al. One-year clinical results with the slow-release, polymer-based, paclitaxel-eluting TAXUS stent: The TAXUS-IV trial. Circulation 2004;109:1942–7. Moses JW, Leon MB, Popma JJ, et al. Sirolimus-eluting stents versus standard stents in patients with stenosis in a native coronary artery. N Engl J Med 2003;349:1315–23. Morice MC, Serruys PW, Sousa JE, et al. A randomized comparison of a sirolimus-eluting stent with a standard stent for coronary revascularization. N Engl J Med 2002;346(23):1773–80. Kandzari DE, Leon MB, Meredith I, et al. Final 5-year outcomes from the Endeavor zotarolimus-eluting stent clinical trial program: comparison of safety and efficacy with first-generation drug-eluting and bare-metal stents. JACC Cardiovasc Interv 2013;6(5):504–12. Serruys P, Ruygrok P, Neuzner J, et al. A randomised comparison of an everolimus-eluting coronary stent with a paclitaxel-eluting coronary stent: the SPIRIT II trial. EuroIntervention 2006;2:286–94. Stone GW, Midei M, Newman W, et al. Comparison of an everolimus-eluting stent and a paclitaxel-eluting stent in patients with coronary artery disease: a randomized trial. JAMA 2008;299:1903–13. Taniwaki M, Stefanini GG, Silber S, et al. 4-year clinical outcomes and predictors of repeat revascularization in patients treated with new-generation drug-eluting stents: a report from the RESOLUTE All-Comers trial (A Randomized Comparison of a Zotarolimus-Eluting Stent With an Everolimus-Eluting Stent for Percutaneous Coronary Intervention). J Am Coll Cardiol 2014;63:1617–25. Onuma Y, Serruys PW. Bioresorbable scaffold: the advent of a new era in percutaneous coronary and peripheral revascularization? Circulation 2011;123:779–97. Ellis SG, Kereiakes DJ, Metzger DC, et al. Everolimus-Eluting Bioresorbable Scaffolds for Coronary Artery Disease. N Engl J Med 2015;373(20):1905–15. Hoppmann P, Kufner S, Cassese S, et al. Angiographic and clinical outcomes of patients treated with everolimuseluting bioresorbable stents in routine clinical practice: Results of the ISAR-ABSORB registry. Catheter Cardiovasc Interv 2016;87(5):822–9. Speck U, Stolzenburg N, Peters D, Scheller B. How does a drug-coated balloon work? Overview about coating technologies and their impact. J Cardiovasc Surg (Torino) 2015; epub ahead of print. Sojitra P, Yazdani S, Otsuka F, et al. CRT-123 A Novel Nano Particle Sirolimus Delivery Via Coated Balloon. J Am Coll Cardiol Intv 2013;6(2_S):S40–S40. Dani SI. Novel nanocarrier sirolimus-coated balloon for coronary and peripheral application. 2015. Available at: www. nanolute.net/wp-content/uploads/2015/12/TCT-2015-SCBfor-coronary-and-peripherical-application.pdf (Accessed 9 September 2016). Togni M, Windecker S, Cocchia R, et al. Sirolimus-eluting stents associated with paradoxic coronary vasoconstriction. J Am Coll Cardiol 2005;46(2):231–6. Hofma SH, van der Giessen WJ, van Dalen BM, et al. Indication of long-term endothelial dysfunction after sirolimus-eluting stent implantation. Eur Heart J 2006;27(2):166–70. Ali RM, Degenhardt R, Zambahari R, et al. Paclitaxel-eluting balloon angioplasty and cobalt-chromium stents versus conventional angioplasty and paclitaxel-eluting stents in the treatment of native coronary artery stenoses in patients with diabetes mellitus. EuroIntervention 2011;7 Suppl K:K83–92. Mathey DG, Wendig I, Boxberger M, et al. Treatment of bifurcation lesions with a drug-eluting balloon: the PEPCAD V (Paclitaxel Eluting PTCA Balloon in Coronary Artery Disease) trial. EuroIntervention 2011;7 Suppl K:K61–5. Belkacemi A, Agostoni P, Nathoe HM, et al. First results of the DEB-AMI (drug eluting balloon in acute ST-segment elevation myocardial infarction) trial: a multicenter randomized comparison of drug-eluting balloon plus bare-metal stent versus bare-metal stent versus drug-eluting stent in primary percutaneous coronary intervention with 6-month angiographic, intravascular, functional, and clinical outcomes. J Am Coll Cardiol 2012;59(25):2327–37. Wöhrle J, Werner GS. Paclitaxel-coated balloon with baremetal stenting in patients with chronic total occlusions in native coronary arteries. Catheter Cardiovasc Interv 2013;81 (5):793–9. Unverdorben M, Kleber FX, Heuer H, et al. Treatment of small coronary arteries with a paclitaxel-coated balloon catheter in the PEPCAD I study: are lesions clinically stable from 12 to 36 months? EuroIntervention 2013;9(5):620–8. Zeymer U, Waliszewski M, Spiecker M, et al. Prospective ‘real world’ registry for the use of the ‘PCB only’ strategy in small vessel de novo lesions. Heart 2014;100(4):311–6. Woehrle J, Motz W, Möbius-Winkler S, et al. Sequent please worldwide registry: Results of Paclitaxel coated balloon angioplasty for treatment of de-novo coronary artery disease. J Am Coll Cardiol 2012;59(13s1):E57-E57. Cortese B, Fetiveau R, Carrera A, et al. TCT-417 Treatment of coronary artery disease with a new-generation drug-coated balloon: preliminary results from the Italian Elutax SV Registry. J Am Coll Cardiol 2015;66(15_S). Ho HH, Ooi YW, Loh KK, et al. Clinical Efficacy and Safety of SeQuent Please Paclitaxel-Eluting Balloon in a RealWorld Single-Center Registry of South-East Asian Patients. Int J Cardiol Heart Vessels 2013;1 :37–41. Waksman R, Serra A, Loh JP, et al. Drug-coated balloons for de novo coronary lesions: results from the Valentines II trial. EuroIntervention 2013;9(5):613–9. Uhlemann M, Möbius-Winkler S, Adam J, et al. The Leipzig Prospective Drug-Eluting Balloon-Registry - Outcome of 484 Consecutive Patients Treated for Coronary In-Stent Restenosis and De Novo Lesions Using Paclitaxel-Coated Balloons. Circ J 2016;80(2):379–86. Cortese B, Micheli A, Picchi A, et al. Paclitaxel-coated balloon versus drug-eluting stent during PCI of small coronary vessels, a prospective randomised clinical trial. The PICCOLETO study. Heart 2010;96(16):1291–6. Cremers B, Biedermann M, Mahnkopf D, et al. Comparison of two different paclitaxel-coated balloon catheters in the porcine coronary restenosis model. Clin Res Cardiol 2009;98(5):325–30. Latib A, Colombo A, Castriota F, et al. A randomized multicenter study comparing a paclitaxel drug-eluting balloon with a paclitaxel-eluting stent in small coronary vessels: the BELLO (Balloon Elution and Late Loss Optimization) study. J Am Coll Cardiol 2012;60(24):2473–80. Kleber FX, Rittger H, Ludwig J, et al. Drug eluting balloons as standalone procedure for coronary bifurcational lesions: results of the randomized multicenter PEPCAD-BIF trial. Clin Res Cardiol 2016;105:613–21. Rosenberg M, Chin K, Bin Wan Ahmad W, et al. Prospective, large-scale multicentre trial for the use of paclitaxelcoated balloons in de novo coronary lesions: the PCBONLY all-comer registry.Abstracts EuroPCR 2016, May 2016. Available at: www.pcronline.com/eurointervention/ AbstractsEuroPCR2016_issue/abstracts-europcr-2016/ Euro16A-OP1057/prospective-large-scale-multicentretrial-for-the-use-of-paclitaxel-coated-balloons-in-de-novocoronary-lesions-the-pcb-only-all-comer-registry.html#sthash. scc6h5SF.dpuf (Accessed 9 September 2016). Cortese B, Silva Orrego P, Agostoni P, et al. 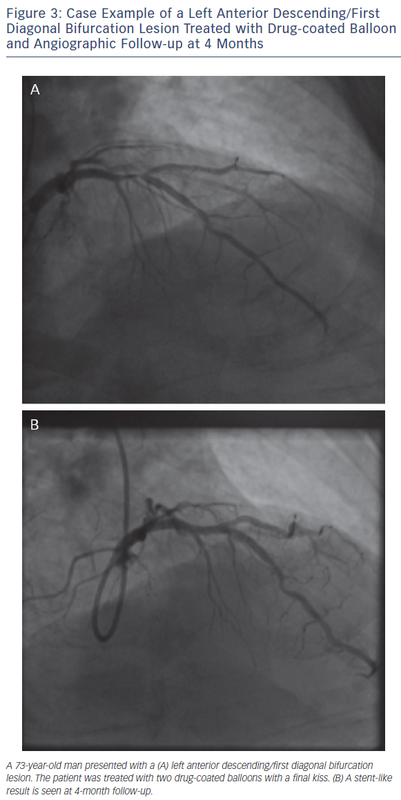 Effect of DrugCoated Balloons in Native Coronary Artery Disease Left With a Dissection. JACC Cardiovasc Interv 2015;8(15):2003–9. Kleber FX, Rittger H, Bonaventura K, et al. Drug-coated balloons for treatment of coronary artery disease: updated recommendations from a consensus group. Clin Res Cardiol 2013;102(11):785–97.